The year 2017 marks 80 years since the founding of BJE-Los Angeles. This history is excerpted from a rich article by BJE Executive Director Dr. Gil Graff. Click here to read the full article. In 1937, the Los Angeles Jewish Community Council—constituted, initially, as the United Jewish Community—founded the Bureau of Jewish Education employing a local rabbi as “technical advisor.” During its earliest years, BJE functioned primarily as a financial allocations agent for the Jewish Community Council. Its 1938 budget was $23,290, of which $22,000 was for school subventions. Recognizing the need to more effectively address Jewish educational needs in a growing community—estimated at over 140,000 by 1944—the Jewish Community Council engaged Alexander Dushkin, Executive Director of the Jewish Education Committee in New York City, to assess the Jewish educational situation in LA and offer recommendations. Dushkin proposed strengthening the BJE, starting with engagement of a highly qualified Executive Director. The Jewish Community Council authorized a budget of $75,000 and Dr. Samuel Dinin, registrar of the Teachers Institute of the Jewish Theological Seminary, in New York, was hired as Executive Director. In the two decades post-World War II, Los Angeles Jewry grew to an estimated population of 496,000, seven percent of the total population of LA County. While, in 1944, there had been 4,415 students enrolled in Jewish schools in LA, enrollment exceeded 28,000 by 1961, including 761 students in the community’s five day schools. BJE’s work was primarily directed at strengthening existing synagogue-sponsored supplementary school programs and working with educators. Another BJE teen initiative of the late 1960s/70s, was Havurat Noar. This program combined synagogue-based classes with a series of weekend retreats. The program was operated by BJE in close collaboration with a score of Reform and Conservative congregations, and enrolled 450 participants each year, into the 1990s. By the beginning of the 21st century, scores of “Israel experience” programs were meeting the needs and interests of teens. After a 37-year “run,” BJE sunset its summer Ulpan, after summer 2000. Starting in the early 1990s, BJE had begun recruiting, orienting and leading groups of LA teens on “March of the Living,” an international study/travel experience surrounding Yom HaShoah in Poland and Yom HaAtzma’ut in Israel. By 2016, the LA program had grown to 222 participants—the largest number of teens from any city in the U.S.—drawn from high schools across the city. As teens’ readiness to commit to multiple weekend retreats waned, BJE, in consultation with synagogue partners, sunset Havurat Noar and companion weekend retreat programs it had conducted. Instead, it initiated a robust service learning program, meeting teens “where they were.” Known as BJE Impact, the service learning approach connects community service with reflection linked to Jewish wisdom. In 1960-61, five LA day schools—all Orthodox—served 761 students. In school year 2016-17, 9,692 students attended 37 local day schools. Enrollment at Community, Conservative and Reform day schools accounts for more than 40 percent of current participation. 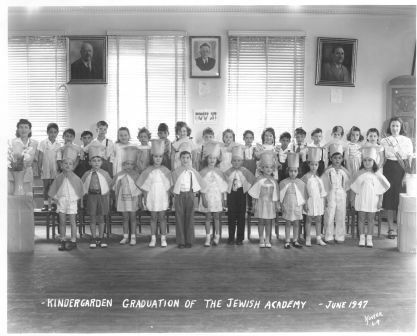 Early in the development of LA day schools, BJE services mirrored those provided in supplementary schools: consultation and professional development were provided and organized by a BJE educator with expertise in yeshiva curriculum and instruction. As other-than-Orthodox day schools emerged, starting in the late 1960s, a staff person with particular expertise in Hebrew language instruction was dedicated to consultative services for this growing sector. By the 1990s, BJE had partnered with the Western Association of Schools and Colleges (WASC) and the California Association of Independent Schools (CAIS) to ensure that all its affiliated day schools undertook self-study and accreditation processes; it worked with schools to address recommendations emerging from this internal and external review. Early in the 21st century, BJE day school services turned, largely, to operational issues: best practices in governance and finance, accessing government resources and endowment development. Through a leadership commitment from the Lainer family, and partnership with several foundations, schools, the Jewish Federation and individual donors, BJE was able to initiate an ambitious endowment campaign in 2008, with a first phase goal of $100 million. As a function, initially, of the Jewish Community Council, BJE policy was shaped by a committee of the Council headed by a Council-appointed Chair. The LA Community Council was composed of 163 Jewish organizations. It was consistent with the ethos of the Council that BJE embrace a broad spectrum of school types and that the committee relating to BJE include multiple voices and perspectives. With the merger of the Council and Federation in 1959, creating the Jewish Federation Council, BJE continued to function as a committee of the larger entity. In 1982, the Jewish Federation Council undertook a review of the Bureau and recommended that BJE—in a friendly “spin off”—become an independent agency affiliated with the Federation Council. In 1990 the organization became completely autonomous. The current by-laws of the now long-autonomous BJE call for an elected board of 40-55 directors and officers, “broadly representative” of the LA Jewish community, with Presidents serving as life members of the board. The organization has consciously worked to ensure that the diversity inherent in this mandate is achieved. From BJE’s inception, shared commitment to building Jewish education has brought together people of differing backgrounds and perspectives in pursuit of a common cause. There are, perhaps, four key attributes that have collectively contributed to the enduring vitality of the Los Angeles BJE: a mission-driven approach—surrounding a compelling mission—to decision-making and strategic action; governance by a board of diverse backgrounds and perspectives; commitment to collaboration and partnership in advancing mission-driven goals; and professionalism (and all that this connotes) in the organization’s activities and interactions with the individuals and entities to which it relates. Though, over the years, the mission has been reviewed and refined, its fundamental foci have remained: enhancing the quality of Jewish education, promoting access (when there are barriers) to Jewish education and encouraging participation in Jewish education. The capacity of 20 professional staff and 50 directors of the board to accomplish BJE’s mission depends in great measure on collaboration and partnership. Schools, youth groups, camps, foundations, federations, families, universities, denominational offices of education, national organizations focused on the advancement of particular types of Jewish education—each of these represents a potential partner in achieving specific goals and objectives. In its work of encouraging day school endowment development, engaging teens in Jewish service learning activity, providing professional development opportunities for educators; indeed, in every facet of its activity, BJE advances its goals by partnering with others. The impact of such “leveraging” represents a win-win proposition for the partnering organizations eager to fulfill their missions, with children and families—and the Jewish communities of which they are a part—the ultimate beneficiaries. Partnership requires trust, a function of the professionalism that must characterize any enduring organization. In LA, not only was the general connotation of “bureau” an issue, the institution had, over time become an independent entity; it was no longer a “bureau of” a larger, sponsoring organization. After considerable internal discussion and consultation with stakeholders, the BJE board determined that there was name equity attached to its “historic” BJE moniker. It “repurposed” the “B,” adopting the name BJE: Builders of Jewish Education, in 2009. The current time is one of significant change in Jewish education. Technology has made knowledge—including Jewish knowledge—immediately available to anyone who seeks it. Synagogue membership has declined, and educational options outside the synagogue have proliferated. Models of complementary Jewish education continue to be re-imagined. Day school enrollment in LA has remained fairly stable over the past decade; it has not grown. Alongside efforts to expand financial resources to those who require tuition assistance are experiments in blending online instruction with a reduced number of on-site teachers to substantially reduce costs. Early childhood education providers recognize, today, even more than in previous generations, that not only the child but the parents are part of the learning community of the early childhood education center. Both federations and foundations recognize the importance of partners “on the ground” equipped to deliver value in shaping and implementing visions of possibility. BJE has demonstrated its capacity to serve in this role; it is a trusted partner in initiatives ranging from early education, to teen engagement, to (day school) endowment development. Within the most recent decade, BJE launched www.JKidLA.com, a website that provides current, comprehensive information about Jewish educational opportunities, broadly defined, available for children and families. The website is visited by more than 10,000 unique visitors annually, with nearly 5,000 subscribers requesting bi-weekly e-blasts. Having one site that is familiar with virtually all available opportunities and looks to meet the needs of individual families rather than “push” a particular school or program has done much to “link the silos” of Jewish education for LA families. It is an approach that has, since its launch in LA, been replicated in other communities. Recognizing the essential role of teachers, professional development opportunities have been provided system-wide, in all educational sectors. Most recently, through grant investment by the Jewish Federation and the Jim Joseph Foundation, BJE has been able to strengthen and enrich the professional development of educators engaged in providing experiential education opportunities for teens as part of a Los Angeles Jewish Teen Initiative. Over the course of decades, BJE has worked with schools to help meet students’ diverse learning needs. Initiatives have included special education resource rooms at day schools, grants in support of “magnet” (open to all) complementary education programs for learners with special needs and early intervention testing. At this writing, BJE looks forward—with recently-announced grant support from the Jewish Community Foundation of Los Angeles—to initiating access to expanded services at day schools to enable learners with special learning needs to more readily obtain the services they require on campus at reasonable cost. In looking to the next three to five years, there are five key areas on which BJE is focused in carrying forward its mission. By BJE’s 85th year, we look forward to expanded numbers of families with young children engaged in Jewish learning experiences; significant growth in the number of Jewish teens engaged in service learning; a broadening of the number and range of students whose learning needs are effectively accommodated within the Jewish day school setting; substantial growth in endowment development for long-term support of Jewish education; and further expansion of models of meaningful part-time Jewish educational engagement. As with all living organisms, the Jewish people continues to evolve. In like fashion, the ways that Jews educate successive generations metamorphoses over time. “You shall teach your children diligently” does not suppose a fixed formula. In 21st century Los Angeles, BJE: Builders of Jewish Education is committed—building on its accomplishments of 80 years—to advancing its Jewish educational mission from generation to generation. *Until 1990, BJE was a committee of the Jewish Federation; its lay leader was a committee chair.